150 King West is Certified GOLD! 150 King West has achieved BOMA BESt® Gold certification. 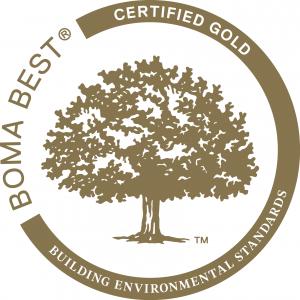 BOMA (Building Owners and Managers Association) BESt (Building Environmental Standards) is Canada’s largest environmental assessment and certification program for existing buildings with over 5,000 buildings obtaining a certification or recertification. The BOMA BESt® Program requires meeting the BEST Practices for Energy and Environmental Management in six key areas: energy, water, waste reduction and site, emissions and effluents, indoor environment and environment management. To learn more about the BOMA BESt® program, please visit www.bomabest.com.